Former President Dr. A P J Abdul Kalam, the 'missile man' who became popular as 'People's President' died after he suffered a massive cardiac arrest and collapsed during a lecture at the IIM Shillong on Monday evening. Kalam, who would have turned 84 in October, was confirmed dead more than two hours after he was wheeled into the ICU of Bethany hospital in a critical condition following the collapse at around 6.30 PM. Arriving at the Indian Institute of Management around 5.40 PM, he took rest for sometime and started the lecture on 'Livable Planet' at 6.35 pm. He collapsed five minutes later, according to Director, IIM-Shillong, Prof De. Kalam last tweeted "Going to Shillong to take course on livable planet at IIM." He was admitted to the Bethany hospital at 7 PM, a km away from the institute. Government declared national mourning for seven days. President Pranab Mukherjee,Vice President Hamid Ansari, Prime Minister Narendra Modi, Union Home Minister Rajnath Singh and host of personalities condoled the sudden and untimely demise of Dr. Kalam. Born on 15 October 1931 in Rameshwaram in Tamil Nadu, Dr. A. P. J. Abdul Kalam overcame all odds to study physics at the St. Joseph's College, Tiruchirapalli and aerospace engineering at the Madras Institute of Technology, Chennai. His entire life is a life of simplicity and high values. 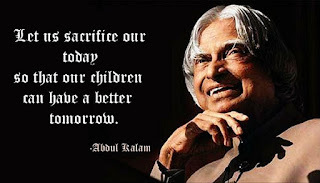 Kalam spent four decades as a scientist and science administrator at the Defence Research and Development Organisation (DRDO) and Indian Space Research Organisation (ISRO). His role in development of ballistic missile and launch vehicle technology earned him the moniker - 'Missile Man'. Kalam played a pivotal role ian the nuclear tests that India conducted in 1998 in Rajasthan's Pokharan. Kalam was conferred with Bharat Ratna, India's highest civilian honour, in 1997 for his immense and valuable contribution to country's scientific research and modernisation of defence technology. Dr Kalam was elected the President of India in 2002, defeating Lakshmi Sahgal and was supported by both the Indian National Congress and the Bharatiya Janata Party, the major political parties of India. He was currently a visiting professor at several prestigious academic and scientific institutions like the Indian Institute of Management Ahmedabad and Indian Institute of Management Indore, Chancellor of the Indian Institute of Space Science and Technology Thiruvananthapuram. 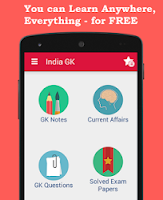 Kalam advocated plans to develop India into a developed nation by 2020 in his book India 2020. Dr Kalam has received several prestigious awards, including the Bharat Ratna, India's highest civilian honour. 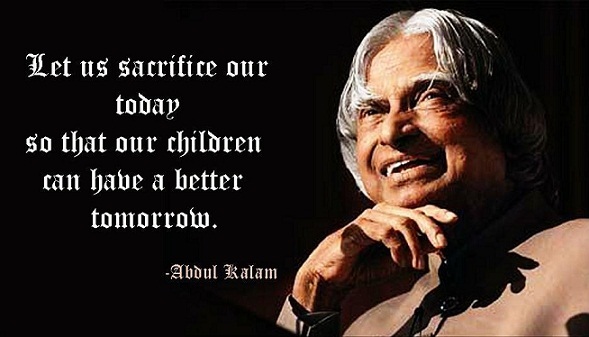 Dr Kalam is known for his motivational speeches and interaction with the student community in India. He launched his mission for the youth of the nation in 2011.